You can order in our online store by clicking on the link below. 1 lb. foam is weak and soft. Most internet spa covers are built with 1 lb. foam. We do not build covers with 1 lb. foam because they will not last. 1.5 lb. foam is 33% more dense than 1 lb., and has a 4"-2" taper. This is our standard cover and is priced close to the 1 lb. covers you will find. We recommend this for most tubs. Up to 84" - $374.99 + TN tax if app. 85" - 96" - $399.99 + TN tax if app. ﻿2 lb. foam﻿ is 2 X as dense as 1 lb., and has a 5"-3" taper. This is the cover we recommend if your tub is recessed in a deck, susceptible to foot traffic, or likely to have extended heavy snow. Up to 84" - $424.99 + TN tax if app. 85" - 96" - $474.99 + TN Tax if app. ﻿3 lb.﻿ foam is 3 X as dense as 1 lb. and has a 5"-3" taper. This is the version one would order primarily when there is an in-ground spa built into the patio with a wide span. Up to 84" - $574.99 + TN tax if app. 85" - 96" - $624.99 + TN tax if app. Why does foam density matter? The higher the density of the foam, the more resistant it is to water penetration, and the stronger it is when faced with accumulating snow, or accidental foot traffic. What is the life expectancy of a spa cover? We have found that the average life expectancy of a cover is about 3 years. There are various factors that impact the life of a cover, including exposure to extreme weather, and handling of the cover. Double Seal Foam add $35.00 - If you purchase the Double Seal upgrade, we will wrap the foam with two layers of plastic instead of just one layer, which is standard. This second layer provides extra protection against moisture, which is a leading cause of foam degredation. When you add a cover lift to your hot tub, you make it easier to open and close the cover. But often times when people flip the cover back on the lift, they do not remember to undo the straps on the back side of the tub. If the straps remain locked while the cover is flipped back, this could cause the clips to break off of the tub. BackStraps give more freedom to leave the cover locked on the back while the cove is opened. Old Cover Removal add $35.00 (Local Service) - An old cover is usually waterlogged and breaking apart. We will remove it. But that means we have to cut it up so it will fit in a dumpster then pay to have the dumpster picked up. We do offer Custom Designer Covers with Designer Fabrics. 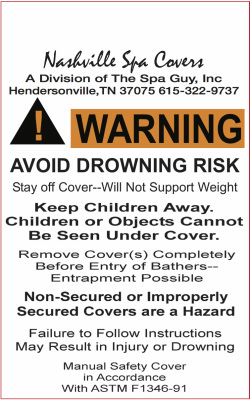 Nashville Spa Covers New Hot Tub Covers Comply with Manual Saftey Cover ASTM Standard F1346-91. 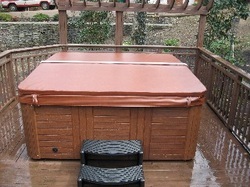 Quality Hot Tub Cover Products! !